Soup is a staple of my life and my cooking. I even wrote a book about soup called Saved By Soup (published by Harper Collins, and available in hardcover or e-book) because there have been so many times that soup literally saved the day or meal or family harmony. I often joke that soup, in our house, is one of the three major food groups, not to belittle the USDA food pyramid. But really, soup goes a long way to feeding us whether we’re in Italy or at home in the US. Here is the first of a few recipes for Tuscany’s classic soups. Like many soups in Italy, they are served with a filo, (literally a “thread” or “string” in Italian), of olive oil poured carefully over each serving. This little bit of oil surprisingly enriches the soup and makes it even more delicious. Enjoy!! Heat 2 tablespoons of the olive oil in a medium-size heavy saucepan or casserole. Add the onion and cook, stirring, until the onion is soft. Add the beans and the chard and stir until the chard wilts and can be mixed with the beans. Add the broth and bring the soup to a simmer. Cover the pot and cook about 20 minutes until the chard is very tender. Use an immersion blender to semi-puree the soup. (You can also transfer the soup to a food processor or blender.) 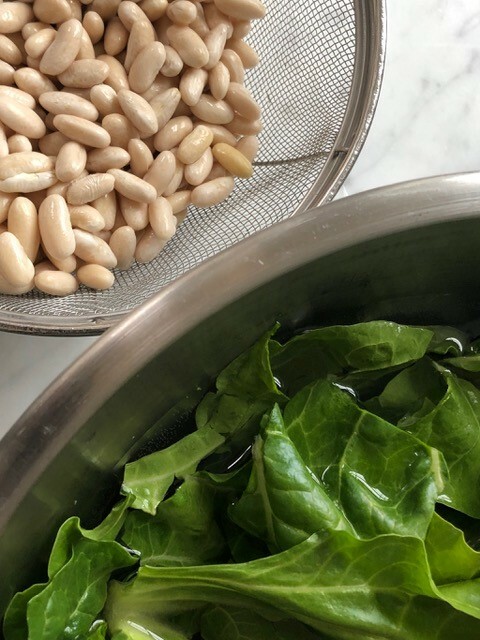 My preference is to mostly, but not completely, puree the beans and chard to give the soup more texture. The soup can be completely pureed as well. Season with salt to taste. Use the remaining tablespoon of olive oil to carefully pour a thin stream over of each serving.